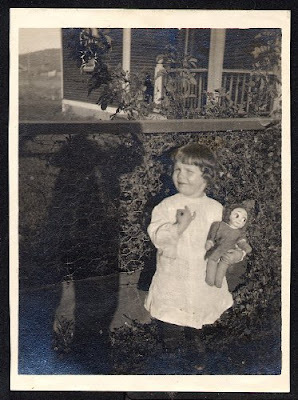 The photo to the left is dated 1915 and features a cute Little Mama with her googly doll, Hug Me Tight. 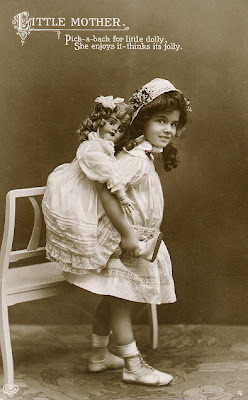 Postal cards featured sweet children with their toys and this Little Mama is particularly fetching as she gives her dolly a ride. Can you imagine the handwork on these 2 dresses? 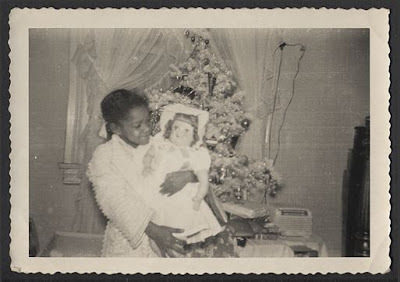 1950s Christmas dolly... not a lot of black dolls available at that time. This Little Mama looks lovingly at her Mama Doll... we find lots of these heads... arms & legs were frequently made of "magic skin" which rotted... leaving only the intact head. These two sweet toddlers appear afraid of the camera... note the Little Mama wears a locket, bracelet, and (I think?) a ring. 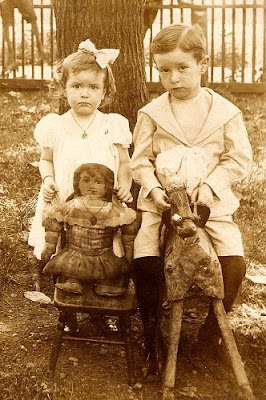 The boy is riding his skin horse and the girl's factory made cloth doll sits on a great little wooden chair... likely painted red. And... yes... I collect vintage photos... of many different subjects. The first I collected were of little girls with their dolls and I've never stopped adding to the collection. I find them sweet and evocative of a different place in time... a kinder and more gentle place.